This is a sponsored post. 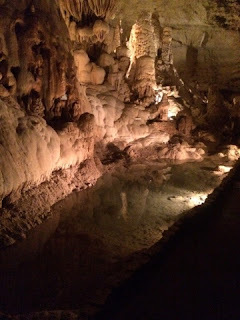 Update: I was in the San Antonio area a couple weeks back with my family and since visiting the the Natural Bridge Caverns was on my list of things to do, we decided to make it happen. In case you were wondering, natural caverns are caves formed naturally by the weathering of rock. Before the tour started we were given "the talk" about the do's and don'ts of the caverns; we were told not to touch the walls of the caverns because of oil on our fingers and it being harmful to the rocks. Y'all it's so freaking beautiful inside the caverns, it's a wonderful thing to experience. The caverns are about 180 feet deep and some of the steps are steep and wet because it's very humid in the caverns. I definitely recommend stretching before, dressing comfortably and wearing a pair of walking shoes with a good grip. 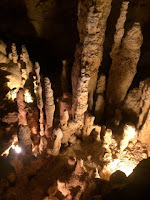 We didn't do any of the other fun activities Natural Bridge Caverns have to offer like the maze or the zip line because, honestly my nerves would have been shattered (maybe next time) lol but hiking the trail of the caverns was Discovery Tour was enough. Nature never ceases to amaze me. At the end of the tour we picked up our photo that was taken while on the tour and headed to the gift shop were I picked up some really cool bat socks to add to my sock collection lol I'm so weird. Naturally Amazing. 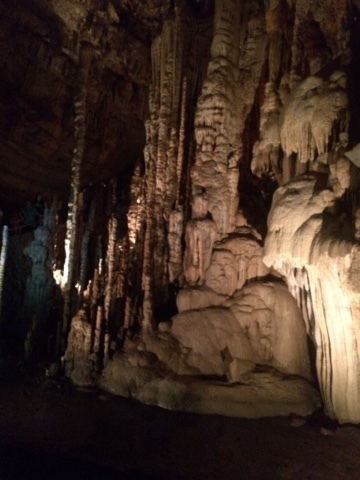 Experience one of the world's premier caverns, Natural Bridge Caverns. 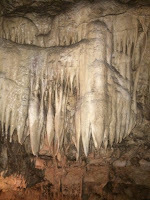 Take the Discovery Tour and see what millions of others have seen - an incredible underground world of natural beauty. This 75-minute tour explores a half-mile of the largest and most spectacular show cavern in Texas. 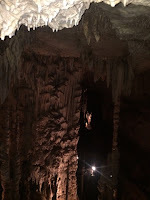 The Hidden Passages Tour gives guests an up-close view of rare and delicate cave formations illuminated by a state-of-the-art lighting system and includes a total darkness experience. Pan for gems, minerals and fossils like miners panned for gold at the Natural Bridge Mining Company. Take on the Canopy Challenge--a 4-level, 60 foot high challenge course and zip lines! Climb, navigate and hang while secured from a safety harness before you "zip" over the Hill Country on one of 4 zip lines. Recently opened, Discovery Village has new food, beverage and retail spaces along with a beautiful courtyard and 5,000 square foot outdoor maze. Picnic grounds also available. Open year-round starting at 9am, with special hours in spring and summer. My Readers Save $2 off an Adult and $1 off a Child's Discovery Tour ticket. Valid only on the Discovery Tour, cannot be combined with any other offer. Limit 6 per coupon.